This is an immersive feature-packed video slot with 5 reels and 25 paylines. Having a total bet in a range between $0.05 and $250 per spin, the slot offers some decent payouts and a plethora of highly rewarding features. Watch out for lava rocks that may at times land on the screen since they will trigger a free spin round once you accumulate four lava rocks during your gaming session. Before the feature starts, you may select from the four free spin modes: 30 spins without any multiplier applied, 5 spins at a x6 multiplier, and two more options in between. The Teeth bonus symbol activates a second-screen Raptor Clash bonus game where you are to hit, bite or claw an enemy dinosaur to defeat him. If you are lucky enough to beat the reptile within 5 rounds, you win a big cash award. 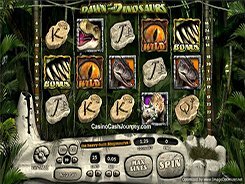 The slot has a unique feature called the Combo Completer that works as follows: a T-Rex egg may randomly land in any position, get collected and after a while be used as a substitute for any dinosaur symbol that is missing to create a winning combination. PLAY FOR REAL MONEY!